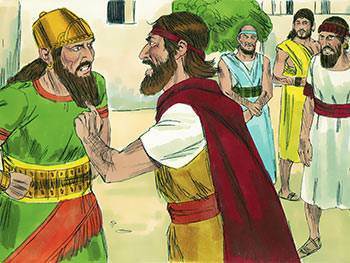 All we know of Elijah before his dramatic appearance as the prophet of God is summed up in the words of 1 Kings 17:1: “Elijah the Tishbite, from Tishbe in Gilead.” Elijah is first seen in a confrontation with King Ahab, who came to the throne about 40 years after the death of Jeroboam. Ahab was an ungodly king who encouraged the worship of false gods, and Elijah begins his ministry by prophesying that God is to pronounce judgment by bringing about a great drought. The drought lasts for more than three years, and results in the rejection of the idol god Baal and a return to the worship of the one true God. Because of the nation’s repentance and Elijah’s prayer of faith on Mount Carmel, the drought ends. 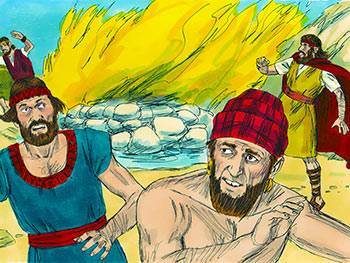 Later Elijah and Ahab face each other again when the prophet predicts his doom and also that of his wife, Jezebel. A prophet has been defined as “someone in whom God groans”. The definition is limited, of course, but it tends to show just what goes on in the heart of someone who shares God’s concern for His world. In that sense, every one of us can be prophets. Can God ‘groan’ in you? Elijah is told by the Lord to go into hiding by the brook Cherith, a tributary of the river Jordan. There he drinks from its waters and is miraculously fed each morning and evening by ravens. The silence of his surroundings, the long days and nights of solitude, the punctual arrival of his food, and the evident working of God’s supernatural hand serve to develop within Elijah a deep sense of dependency upon God. As time goes on, the waters of the brook dwindle under the scorching heat of the sun until, at last, it becomes nothing but a dry channel. 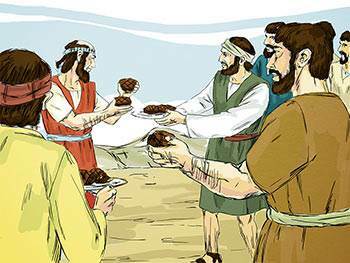 Then comes the word of the Lord to the prophet: “Go at once to Zarephath of Sidon and stay there. 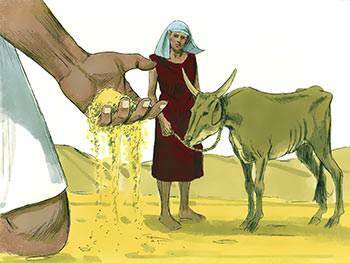 I have commanded a widow in that place to supply you with food” (v. 9, NIV). 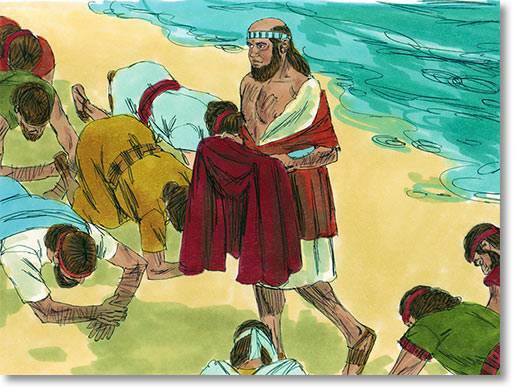 Elijah might not have realised it, but his experience at Cherith was part of the training for what happened on Carmel. It was there, in the quietness, that his ears were trained to hear the voice of God. Has God put you in a place of solitude at the moment? Then be encouraged—a Cherith is the prelude to a Carmel. 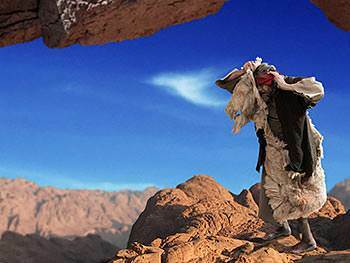 Elijah came from Gilead – rugged, highland country to the east of the river Jordan. 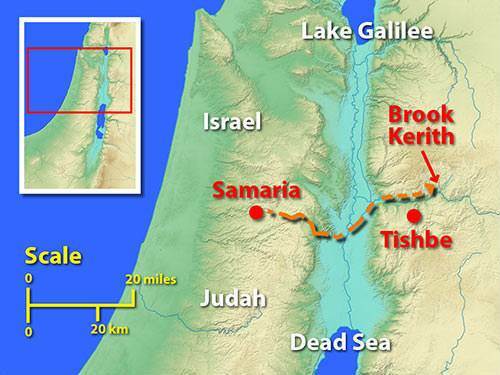 His home was probably at Jabesh-Gilead, a famous Jewish town in Old Testament times. Grain could be grown in some places in Gilead, but the well-watered highlands were best for grazing sheep. 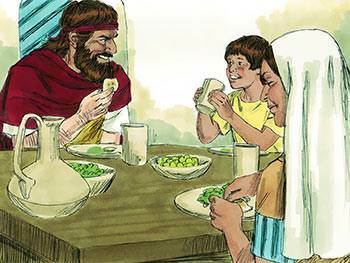 Life here was simple and plain – very different from the luxury of Samaria. He was as stern and rugged as the country he came from. 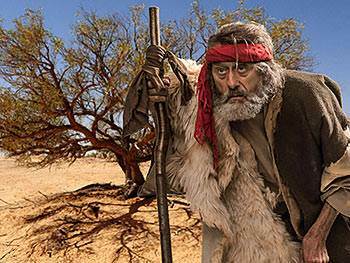 He blazed onto the scene of time, not only to confront Ahab, but also the prophets of Baal. 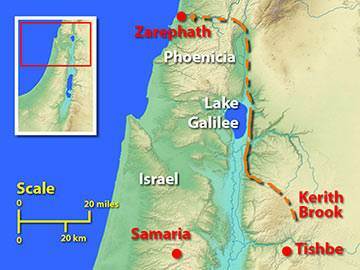 Elijah travels northward from the Jordan into Phoenicia, and ends up at Zarephath, a small port between Tyre and Sidon. Upon entering the city, he sees a widow gathering sticks and asks her for a drink of water. As she turns to bring him the water, he asks her also to bring him some food. At this point the woman tells him a sad and unhappy tale. She has only enough food for one more meal, after which she and her son will starve to death. 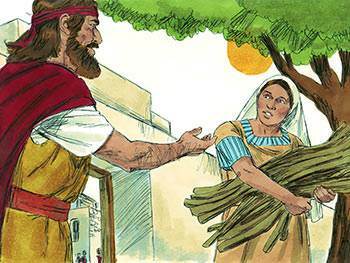 Elijah instructs her not to be afraid, but to go and bake a small cake for him first, and thereafter the God of Israel will provide for them all an unfailing supply of both oil and food. She obeys the prophet’s command and discovers his words to be true. Not long after, the widow’s son dies, but he is restored to life through the prophet’s prayers. In relation to the matter of giving to God, how often we say: “Lord, if You will give to me, then I will give You something in return.” Yet sometimes God waits for us to make the first move. With that thought in mind, read Luke 6:38 again and see if it doesn’t show up in a new light. 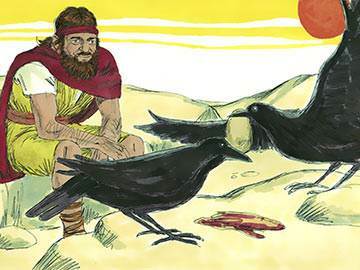 After about three years of severe drought, the Lord speaks to Elijah and informs him that He will soon send rain. 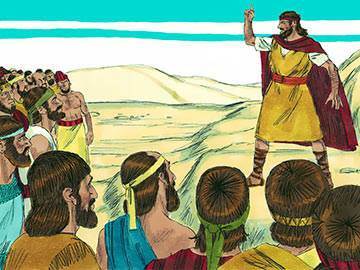 Elijah confronts Ahab once more, and tells him to gather the Israelites and all the prophets of Baal on Mount Carmel. 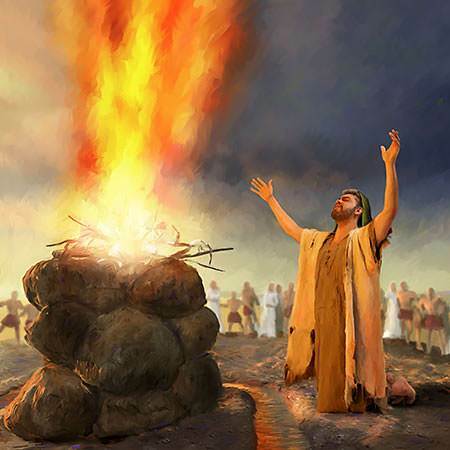 There, two sacrifices are prepared and Elijah challenges the prophets of Baal to pray to their god to send fire from heaven to burn up their sacrifice – and he will do the same. The god who answers by fire is then to be acknowledged as the true God. The prophets of Baal pray earnestly hour after hour—but nothing happens. “How long will you waver between two opinions?” Is Elijah’s word to the people who had gathered on Mount Carmel the word of the Lord for you today? Are you hesitant about coming down firmly on God’s side in some issue? Then today—right now—make up your mind to go God’s way – whatever the consequences. Elijah completes the destruction of idol worship in Israel by executing all the prophets of Baal. As a result, Queen Jezebel, Ahab’s wife, vows to kill Elijah who, upon hearing this threat, becomes extremely apprehensive and ends up in the wilderness fearing for his life. An angel is commissioned to support and strengthen Elijah in the midst of his depression, and after eating the food provided by God he gains sufficient strength to make the forty-day journey to Mount Horeb. There, as he sits in a cave, the Lord comes to him and speaks—but His message comes, not through the mighty wind, the earthquake or even the fire, but in a still small voice. God gives him three specific tasks, and assures him of the preservation of a faithful remnant in Israel. Like to see how an expert counsellor treats depression? Then look at God’s prescription for Elijah’s depression: sleep (v. 5); food (v. 6); conversation (v. 9); ventilation of feelings (v. 10); a change of perspective (vv. 11-12); and a new challenge (vv. 15-16). Ask the Lord to apply the same treatment to you the next time you feel depressed. 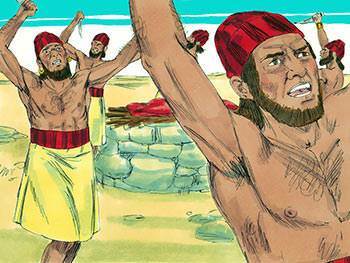 We have no record of Elijah following through on the commission which God gave him to anoint Hazael and Jehu (although we know they became kings in due course—see 2 Kings 8:15 and 9:13), but we have a vivid and detailed account of his meeting with Elisha. 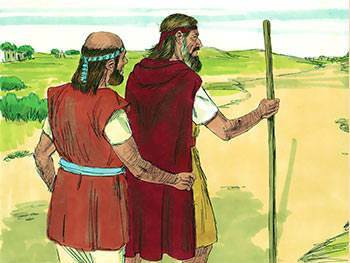 When Elijah meets his successor, he finds him ploughing in a field and, approaching him, casts over his shoulders the shaggy animal-skin cloak which he was accustomed to wear. This is a symbolic gesture to indicate that Elisha is to give up his work as a farmer and become a prophet. 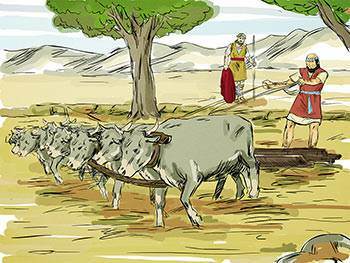 Elisha asks leave to say goodbye to his parents, and after permission is granted, he uses his wooden ox yokes—and probably his plough—as fuel to roast the oxen for a farewell feast. The reason why some Christians get tangled up in the present is because they have never really broken with the past. Elisha knew the importance of breaking with the past in order to free himself for the future. Do you? The years between Elisha’s call and Elijah’s translation to heaven are not recorded in Scripture. Apart from delivering a message of judgment to King Ahab and another to his son Ahaziah, we know little of Elijah’s activity. One of their joint responsibilities seems to have been the administration of various schools of prophets. The day arrives for Elijah to be taken up to heaven, and immediately prior to this event, he asks Elisha if he wants to make him a last request. Elisha asks that he might become a worthy successor, and he is told that his request will be granted if he sees Elijah go up into heaven. 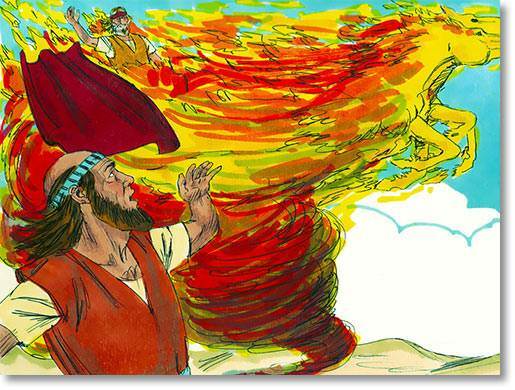 Elisha keeps his eyes on Elijah as he is caught up in a chariot and horses of fire, and receives the coveted mantle. His first miracle with the mantle is the opening up of the Jordan, and those looking on know that because of this miracle, he is truly Elijah’s successor. One thing, and one thing only, brought Elisha the coveted mantle of his master Elijah. He allowed nothing to deter or deflect him, but kept his eyes constantly on his master. And that, in a nutshell, is the secret of all spiritual blessing. So today and every day—keep your eyes upon Jesus. 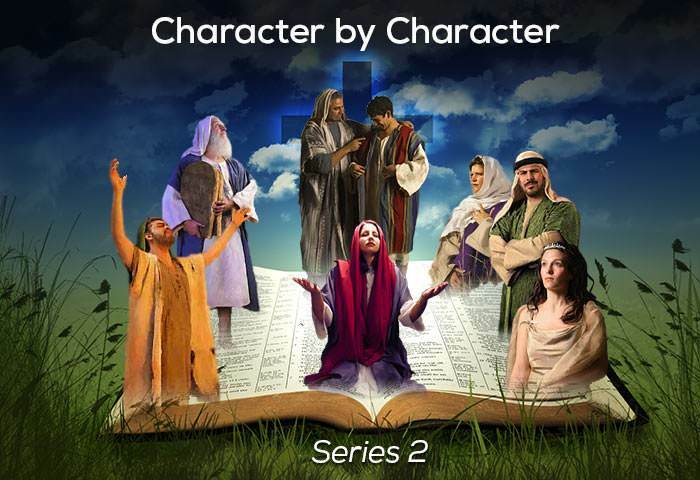 In following the story of his life from Ahab’s court, through Naboth’s vineyard, and on to Horeb, we watch a man very much like ourselves (James 5:17). He was subject to fluctuations in his spirit, at times gripped by depressive moods, prone to disillusionment and discouragement, beset by self-pity, but ever at God’s disposal. The main lesson we learn from his life is this: whenever we place ourselves in God’s hands, no matter how frail and insignificant we may feel, we accomplish far more than we can ever realise.